Not your ordinary sock! Here's an eye-popping collection that raises the bar for sock knitting. Not your ordinary sock! 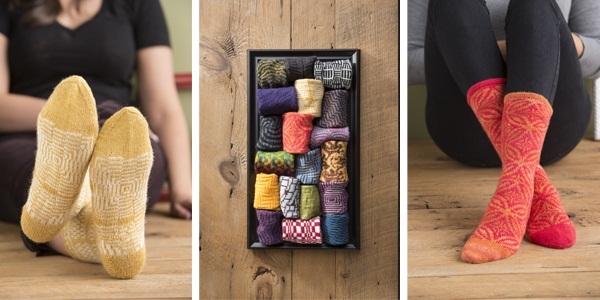 Here’s an eye-popping collection that raises the bar for sock knitting. Stephanie van der Linden is a master knitter and shows her technical skills to great effect in Op-Art Socks. A collector of op-art ceramics, she was inspired to translate graphic optical illusions into knitted patterns for knitted socks, replicating their eye-popping effects. Op-Art Socks contains 19 knitted socks projects. Readers will explore knitting techniques such as graphic colorwork, textured knitting (knit and purl), shadow knitting, and shifting ribbing to create optical illusions. The book includes black-and-white swatches of all patterns so that readers can readily perceive the op-art illusions in each piece. Opt-Art Socks is truly unique in theme and designs. Knitters will go beyond ordinary sock knitting into new territory!